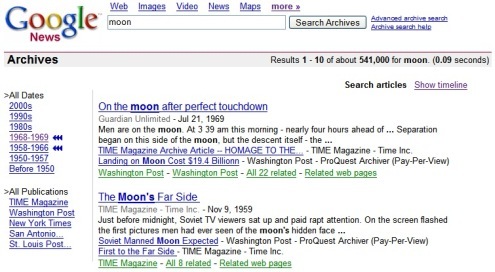 Google has launched News Archive Search, a service that expands Google News with newspaper articles from the last 200 years. Google has digitized newspapers from the archive and used the online editions for the recent content. "The goal here is to be able to explore history as it unfolded. It's fascinating to see how people's attitudes and emotions have changed through time," explained Anurag Acharya, a Google engineer. Google News is limited for the moment to the last 30 days of news and shows only the headlines and brief snippets from the news. The new service will have less sources than Google News, but the earliest news is from "somewhere in the mid-1700s". Some of the most important sources are: Time, New York Times, Washington Post, CNN, Financial Times, Reuters, International Herald Tribune. Google clearly labels subscription-based sources and even shows the cost of a subscription. While the interface is similar to Google News, the new layout is focused on time. The key intervals for a search are marked with an arrow, and there's also a timeline view that shows the most interesting news from each computer-generated interval. Google gives some clues about the underlying algorithms: "News archive search aims to rank results such that the articles/events that would be of interest to users exploring history appear first. We take into account the full text of each article, the publication in which the article appears, how often the underlying event has been referred to or described, in what manner and by whom." News Archive Search is a new step in including other kind of content that was partly unavailable in Google Search. News archives are a valuable source of information and the way Google implemented this service lets you put persons, ideas and events into perspective. Is there a list of sources available in the News Archive search?